It was time to take the 1991 DR350 out for its first dirt-riding experience with me as it’s rider. When you own a bike, you do stupid things. Those stupid things are usually spread out over many months, or years. Yesterday, I covered a few of them in one day. 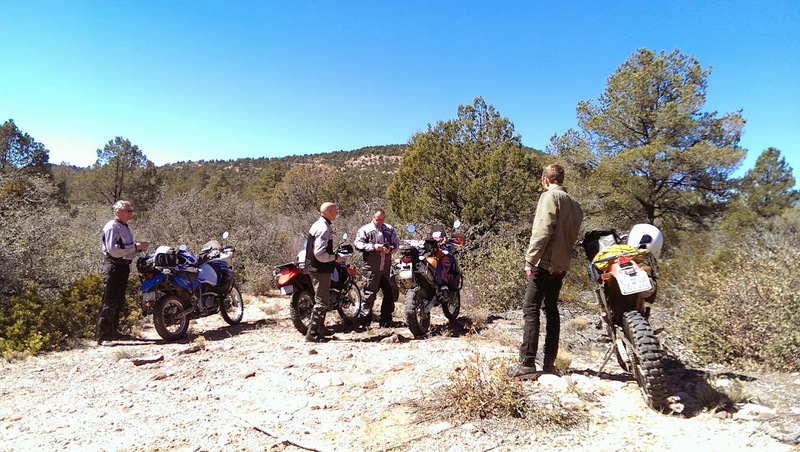 A few of my friends and I planned a fairly easy route that would take us down some very pretty Forest Service roads. The whole trip would take about four hours, including a lunch stop somewhere in the woods. I packed a lunch of champions and got ready. The DR is hard to start when cold. It’s kickstart only and the previous owner suggested that the choke channel might be clogged in the carburetor. I haven’t had a chance to pull the carb and clean it out, so I have to be patient and practice a few tricks (like not pulling the choke all the way out and kicking like mad). Out meetup time was 10:30am, so I got up around 7:00am to get ready. 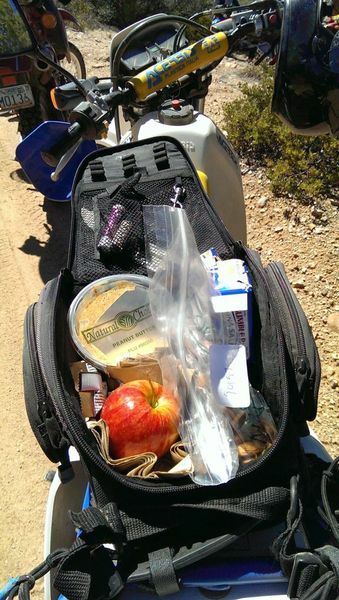 I packed my food into my rigged up tail-bag and got my riding gear together. At 9:00am, it was time to get the bike warmed up and make sure everything was mechanically sound. After about half an hour of kicking, resting, kicking, I was able to get it to burble up and catch but then it would die again. Why won’t it start? This is unusually difficult. I turned the petcocks on, kicked it over and Whooomp! it started right up. My friend Peter came by and we set off to ride to the meetup location together. We got about five blocks from my house, and my bike died. Adhering to the K.I.S.S. rule, I first checked the gas level. I put the tanks on reserve and went to the first gas station, just a couple of blocks away. Freshly gassed up and a little tired from the mornings exertions, we rode the rest of the way to the meetup location – a gas station further down the road. We pulled in to park and wait for the others. As I was trying to shift into neutral with my big, new-to-me dirt bike boots, I lost balance. Dirt bikes are tall, and I had to do a number of things in order to make this one fit me. Even with the 2″ lowering links, dropped forks, and lower stock seat, I was still on my tip-toes. Gas went spilling out of my tank before we were able to pick the bikes back up. Luckily, these bikes are pretty decently protected for spills. Dirt biking isn’t always the most upright sport. Both our bikes were fine, my ego and left arm were a bit bruised and I was starting to feel a bit fatigued and hungry. A few minutes later, the rest of the group converged. 11:00am, kickstands up, time to ride! I had a difficult time getting my head into the ride. There was a brisk, chill wind buffeting us, my 7:00am breakfast had long worn off, and I’d had a fairly physical and tiring morning. Luckily, the first part of the ride was pretty easy. Pavement to a wide, raked dirt road, up into the hills. I wasn’t exactly having fun, but I wasn’t miserable either. At this point, I was mostly there because I said I would. After about an hour of riding, we stopped in a lovely little spot for lunch. It wasn’t the best view, but it was sunny and remote. I found a rock to sit on, ate some lunch and warmed up. A couple of zip-ties later and with help of my bungee net, the plate was re-secured. It ain’t pretty, but it works. After lunch, I was reinvigorated and had a blast. The next section was woodsy and rocky. We rode through a wash with a foot of water and I managed to soak myself. It was great fun! 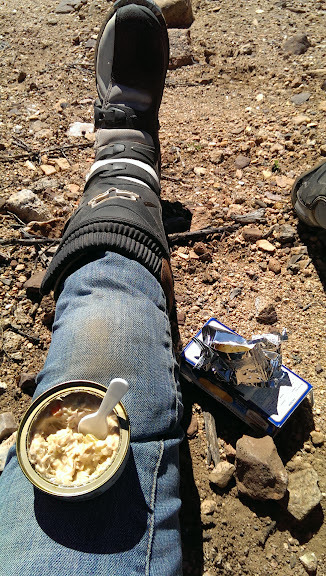 A couple of hours later of great riding, we returned to pavement and decided to stop for lunch. Two of the guys needed to split off before town, so we went to a gas station/deli nearby for some fine dining. While we were enjoying our sammiches in the outdoor seating, a couple of other dual-sport riders pulled up. Turned out we knew them. Small world. 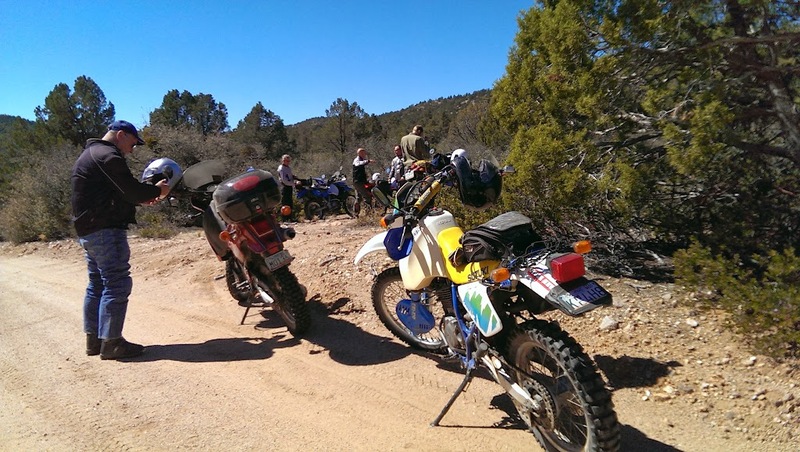 We finished up our lunch and as we were getting our gear together, a few more other riders pulled up. 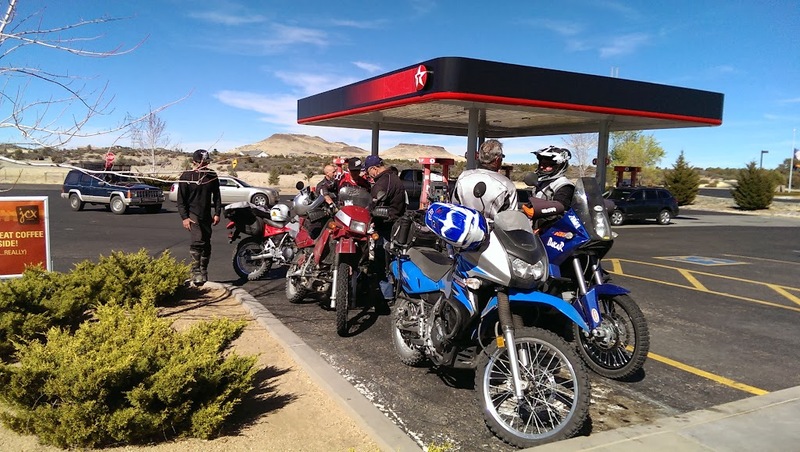 Seems this Texaco gas and deli in the middle of nowhere is a popular hangout for the dual-sport crowd. Even with the morning difficulties, it was a great day. One of the major things to remember is how much your head-space affects your experience. The roads we were on before lunch vs. after lunch weren’t much different in terrain, difficulty, or grade but I was in a completely different mood for the two different sections and they were completely different rides. (1) Really? That’s so basic I hardly want to comment. (2) We all run out of gas on occasion, but it’s still a rookie move. Check your fuel levels! Set your odometer and know at what number you need to refill. (3) It happens. You slip on a rocks in a driveway, put your foot down in a pothole, knock your bike into your friend’s bike…. It’s always embarrassing no matter which way you slice it. I have dropped a bike once in the past ten years. Well, twice now. All three of these things do happen, but usually not in the same day. 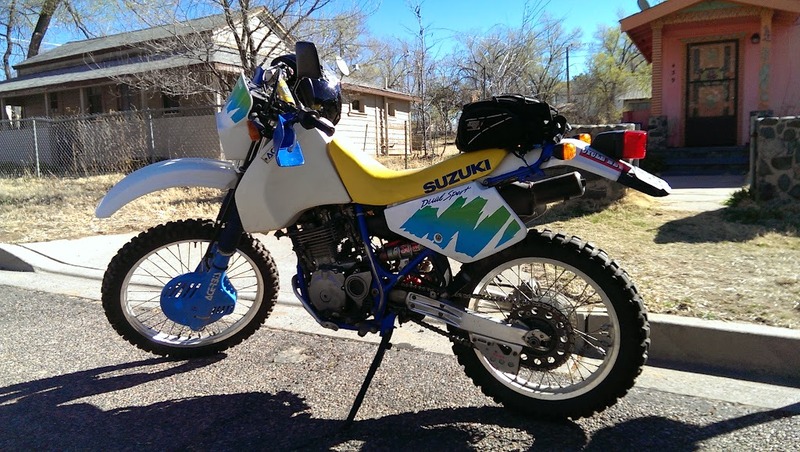 This entry was posted in DR350, fun, geekery, Howlers VMC, masochism, motoring, musings, passions, road trip, southwest, update and tagged DR350, dual-purpose, motoring, off-road, riding, road trip, roadtrip by hoyden. Bookmark the permalink.